A few weeks ago, Ginny made the big switch from a crib to a big girl bed and I posted about my best transition tips. I have to say, it has been going excellent ::furiously knocks on wood:: She has loved her big bed and sleeps great and when baby sleeps, everyone is happy. At first, Ginny was sleeping on a full sized mattress on the floor until I could refinish the bed frame. I refinished the matching dresser before she was born, but didn't end up getting the bed frame part until I was sure we'd use it. Luckily, it was still in our friend's storage unit and she was still looking to get rid of it. I love when things work out! 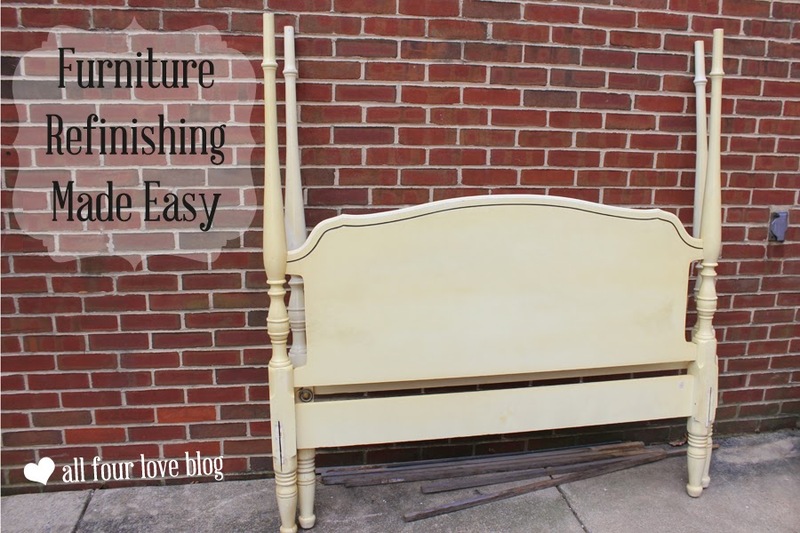 Have you ever refinished a piece of furniture? It is SO much fun. I truly enjoy getting my hands dirty and turning something old and ugly into something beautiful. Yard sales, antique shops, grandma's basement - there are pieces of furniture everywhere just begging to be given a second life. If you have a little bit of time and energy, you can do this too. 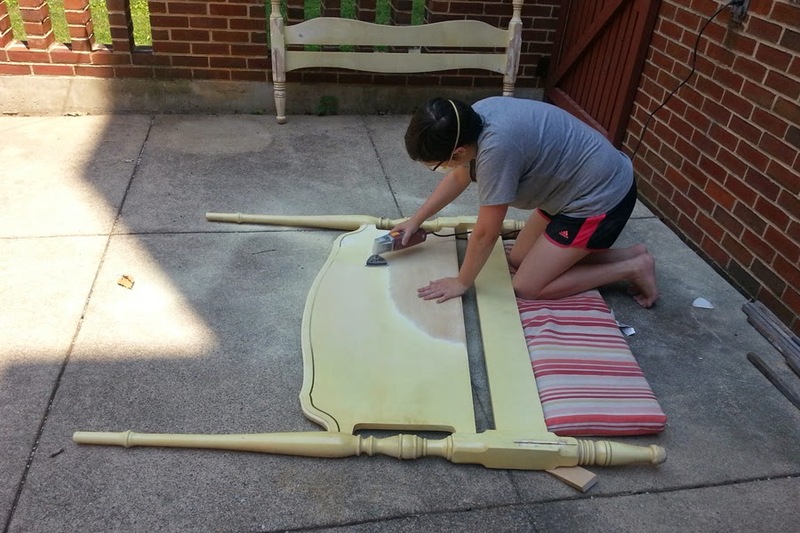 With the dresser, I worked on it while pregnant and during the winter, so it wasn't an option to work on it outside and sand it. There was also a question as to whether the paint was lead based, which we later determined that it was not. 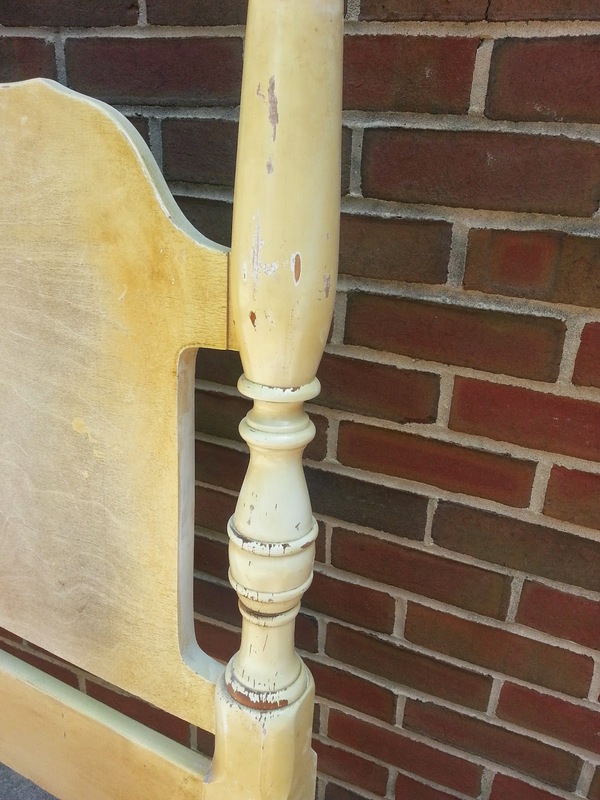 When working on antiques, lead paint is always a possibility, so it's always safer to test it instead of guessing. With the bed, considering it is July, gorgeous outside, and I am most definitely 100% NOT pregnant, I was able to take advantage of a power sander to work out the dings and uneven spots. Before getting started, I stopped at Lowe's to grab some important supplies - sand paper, a sanding sponge, and a breathing mask. With all of the details on the spindles, a sanding sponge is a very smart idea. It can get into all of the nooks and crannies without fighting with folded sand paper. Remember, the lower the number on the sandpaper, the more course the grit. Something like 60 or 80 are great for stripping paint and really getting a surface roughed up, while 180 or 220 are good for smoothing and sanding between coats. To be honest, I wasn't as concerned with getting all of the paint off as I was about evening out all of the dings and nicks in the finish and wood. There were spots where the paint and finish were cracked and chipped down to the wood and it would have shown through the new coat of paint. Almost the entire head board needed to be sanded down. If your goal is to just remove the paint, a stripping agent is the way to go. A stripper, however, won't get rid of the dings - only sanding can even that out. I used an 80 grit pad on the sander at first, then smoothed everything out with a 120 grit pad. Always wear ear, eye, and breathing protection. It was 90+ degrees outside and I would have preferred to not have something strapped to my face, but it is a must. Make sure the kids are inside or far away from you. Breathing paint and finish dust, as mentioned above, is not good. Its too loud, too messy, and too dangerous. Keep the kids away. When you're sanding, don't put too much pressure on the sander - only about the weight of your arm. Too much weight can cause the motor to slow down and can make very obvious and ugly swirly marks in the wood. Go slow and work on small sections. Moving too quickly doesn't give the sander enough time to get through spots and it can take longer - or at least feel that way. Take breaks! The vibrating sander can make your hand/arm go numb if you use it for too long. Don't follow my poor example - whenever you're working with power tools....wear shoes! Once the uneven spots were buffed out, I was able to put a primer coat on everything. Since I didn't completely take the paint off, I chose a primer that would go over it all. 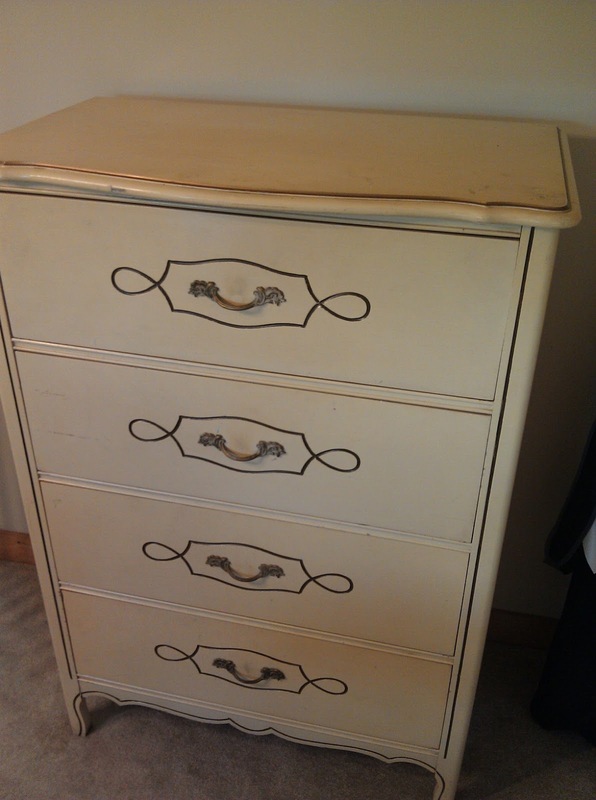 I used the same primer I used on the dresser (which wasn't sanded at all) and it worked great. Seriously, I love this stuff. It could prime glass if you needed it to. Always, always, always prime before you paint and always lightly sand between coats. This is a steadfast rule, like ironing when you sew. It takes more time, but its worth it in the end. Even if it looks like your paint can handle it, its not just about coverage - its about durability over time. 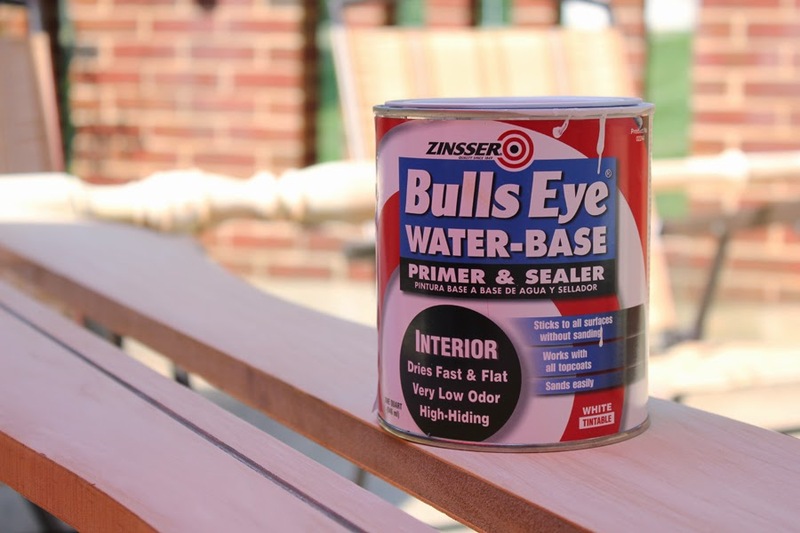 Primer helps paint stick, go on evenly, and stay strong against day to day wear. Once the primer was on and lightly sanded, I began the white coat. Who knew, patio furniture makes for a great work bench! I used Olympic ONE in pure white. This paint is gorgeous - it goes on smooth and is incredibly durable. It is absolutely worth the price. I did two coats (sanding in between with very fine, 220 sandpaper) and let everything dry. I painted light pink along the inlay design on the headboard and footboard and reattached the medallion design. Voila! It took a long time (about 10 hours), but I attribute that to the heat and to the care I took to let coats dry before slathering on more paint. The more patient you are with drying, sanding, and painting, the better the result will be. Here is the end result! I am IN LOVE. This is basically the bed I've always wanted and I am so happy to be able to give it to Ginny. We need to reinforce the bunky board under the mattress a little more, but overall it is one sturdy piece of furniture, ready for its second life. My favorite part about the bed and dresser are the antique details, perfect with just a little touch of patina. With a little help from a step stool, Ginny actually does a great job of climbing in and out. I was a little worried about that at first, but no need - she's got this. Her old crib is currently stored underneath if we ever decide *gasp* to have another, but in the meantime, everyone is nice and happy in their comfy beds. Wonderful work! I love your tip of sanding between coats... I'm not so good with that but I'll make sure to remember next time. Found this post through the SITS Girls Facebook DIY linkup. Wow! You did an amazing job on the headboard and dresser. They are gorgeous! What a lucky little girl (who is beautiful btw). Stopping by from Sits Facebook link up and sharing on my facebook page. Have a great weekend.